In past negotiations aimed at reducing the arsenals of the world’s nuclear superpowers, chiefly the U.S. and Russia, a major sticking point has been the verification process: How do you prove that real bombs and nuclear devices — not just replicas — have been destroyed, without revealing closely held secrets about the design of those weapons? Now, researchers at MIT have come up with a clever solution, which in effect serves as a physics-based version of the cryptographic keys used in computer encryption systems. In fact, they’ve come up with two entirely different versions of such a system, to show that there may be a variety of options to choose from if anyone is found to have drawbacks. Their findings are reported in two papers, one in Nature Communications and the other in the Proceedings of the National Academy of Sciences, with MIT assistant professor of nuclear science and engineering Areg Danagoulian as senior author of both. Because of the difficulties in proving that a nuclear warhead is real and contains actual nuclear fuel (typically highly enriched plutonium), past treaties have instead focused on the much larger and harder-to-fake delivery systems: intercontinental ballistic missiles, cruise missiles, and bombers. Arms reduction treaties such as START, which reduced the number of delivery systems on each side by 80 percent in the 1990s, resulted in the destruction of hundreds of missiles and planes, including 365 huge B-52 bombers chopped into pieces by a giant guillotine-like device in the Arizona desert. But to avert the dangers of future proliferation — for example, if rogue nations or terrorists gained control of nuclear warheads — actually disposing of the bombs themselves and their fuel should be a goal of future treaties, Danagoulian says. So, a way of verifying such destruction could be a key to making such agreements possible. Danagoulian says his team, which included graduate student Jayson Vavrek, postdoc Brian Henderson, and recent graduate Jake Hecla ’17, have found just such a method, in two different variations. “How do you verify what’s in a black box without looking inside? People have tried many different concepts,” Danagoulian says. But these efforts tend to suffer from the same problem: If they reveal enough information to be effective, they reveal too much to be politically acceptable. To get around that, the new method is a physical analog of data encryption, in which data is typically manipulated using a specific set of large numbers, known as the key. The resulting data are essentially rendered into gibberish, indecipherable without the necessary key. However, it is still possible to tell whether or not two sets of data are identical because after encryption they would still be identical, transformed into exactly the same gibberish. Someone viewing the data would have no knowledge of their content, but could still be certain that the two datasets were the same. A nuclear warhead has two essential characteristics: the mix of heavy elements and isotopes that make up its nuclear “fuel,” and the dimensions of the hollow sphere, called a pit, in which that nuclear material is typically configured. These details are considered top-secret information within all the nations that possess such weapons. Just measuring the radiation emitted by a supposed warhead isn’t enough to prove it’s real, Danagoulian says. It could be a fake containing weapon-irrelevant materials which give off exactly the same radiation signature as a real bomb. Probes using isotope-sensitive resonant processes can be used to probe the bomb’s internal characteristics and reveal both the isotope mix and the shape, proving its reality, but that gives away all the secrets. So Danagoulian and his team introduced another piece to the puzzle: a physical “key” containing a mix of the same isotopes, but in proportions that are unknown to the inspection crew and which thus scramble the information about the weapon itself. Think of it this way: It’s as though the isotopes were represented by colors, and the key was a filter placed over the target, with areas that balance each color on the target with its exact complementary color, just like a photographic negative, so that when lined up the colors cancel out perfectly and everything just looks black. But if the target itself has a different color pattern, the mismatch would be glaringly obvious – revealing a “fake” target. In the case of the neutron-based concept, it’s the mix of the heavy isotopes that are matched, rather than colors, but the effect is the same. The country that produced the bomb would produce the matching “filter,” in this case called a cryptographic reciprocal or a cryptographic foil. The warhead to be verified, which can be concealed within a black box to prevent any visual inspection, is lined up with the cryptographic reciprocal or a foil. The combination undergoes a measurement using a beam of neutrons, and a detector which can register the isotope-specific resonant signatures. 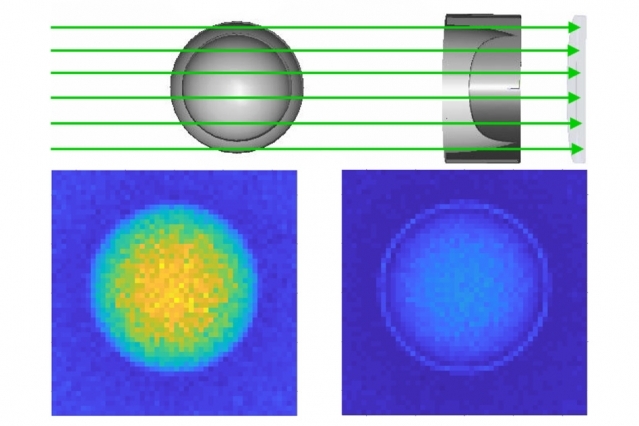 The resulting neutron data can be rendered as an image that appears essentially blank if the warhead is real, but shows details of the warhead if it’s not. (In the alternative version, the beam consists of photons, the "filter" is a cryptographic foil, and the output is a spectrum rather than an image, but the essential principle is the same.) These tests are based on the requirements of a Zero Knowledge Proof – where the honest prover can demonstrate compliance, without revealing anything more. There’s a further disincentive to cheating built into the neutron-based system. Because the template is a perfect complement to the warhead itself, trying to pass off a dummy instead of the real thing would actually do the very thing that nations are trying to avoid: it would reveal some of the secret details of the warhead’s composition and configuration (just as a photographic negative lined up with a non-matching positive would reveal the outlines of the image). Danagoulian, who grew up in Armenia when it was part of Soviet Union before emigrating to the U.S. for college (he earned his bachelor’s at MIT in 1999 and his Ph.D. at the University of Illinois at Urbana-Champaign in 2006), says he remembers vividly the Cold-War days when both the U.S.S.R and the U.S. had thousands of nuclear missiles perpetually at the ready, aimed at each others’ cities. After the fall of the Soviet Union, he says, there was a huge amount of fissile material suitable for bomb-making left in Russia and its former satellites. This material "measured in tens of tons – which could be used for making thousands, if not tens of thousands," of nuclear bombs, he says. Those memories provided a strong motivation to find ways of using his knowledge in physics to facilitate a reduction in the amount of such material and in the number of nuclear weapons at the ready around the world, he says. Karl van Bibber, professor and co-chair of the Department of Nuclear Engineering at the University of California at Berkeley, says that an earlier paper from this team that outlined the concept "attracted much attention when it appeared, but as a theoretical work one could rightly reserve judgment regarding its feasibility in practice." This new paper, however, "goes far as a first scientific demonstration of the technique, particularly as the experiment was performed with the simplest and least favorable photon source available, ... simple enough for this methodology to gain currency in an actual verification program." Thus, van Bibber says, "Danagoulian and team have passed a major bar ... The challenge up next will be tested with higher fidelity surrogates for warheads and ultimately real systems." If a system does someday get adopted and helps bring about significant reductions in the number of nuclear weapons in the world, Danagoulian says, "everyone will be better off. There will be less of this waiting around, waiting to be stolen, accidentally dropped or smuggled somewhere. We hope this will make a dent in the problem."